Some people are content to sit on the beach and catch some rays while reading a book; others like to have a busy schedule while on vacation. If you’re one of the latter, don’t worry! 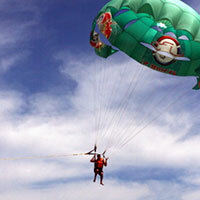 There are plenty of things to do while vacationing in Puerto Vallarta. You can inquire about things to do from any of the “tour” kiosks or at the foot of the pier. Here are a few of our favorites. 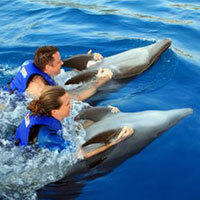 Swim with dolphins in a 90-minute experience at the Nuevo Vallarta Dolphin Center. There is an orientation and informational session first and then into the water with the dolphins! For non-swimmers there is a platform to stand on in shallow water that the dolphins come up to so you may touch them. No cameras are allowed inside; they do, however, take images for you which are available for purchase afterwards (on CD). Keep in mind, they charge a premium for these pictures! 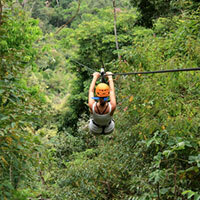 If you’re up for an adventure, try zip-lining over the Mismaloya river. It’s an all-day event, starting with a bus ride to the site in the mountains, an orientation, and then a hair-raising set of twelve zip-lines, zagging back and forth over the Predator set, with the longest zip-line reaching a ¼ mile in length! Of course, there are many other options for “Canopy Tours,” as they’re called in PV, but this one is our favorite because of the location, scenery and tour guides (it was almost like a comedy set!). It’s not always possible to book tee times online, for some courses a call is required for a reservation. Learn more here. 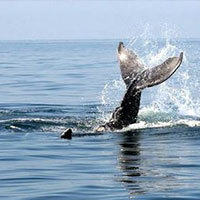 Humpback whales return to Banderas Bay every winter to mate and to give birth. Boats are available for day trips out in the bay to see them – inquire at the pier for availability and pricing – but many times they can be seen breaching from the beach right in front of the condo. Try your hand at deep sea fishing – you could catch marlin/sailfish/swordfish, dorado and bonita tuna – in half-day or all-day trips. The best place to line these up is at the Marina, just south of the airport. You can also charter a small fishing boat from the pier to take you out right within the bay — you might not catch as much, but it’s cheaper and you’re always within site of land (if anyone in your group tends to get seasick). The “flea” market is located downtown on the north side of the river on Insurgentes and Rodriguez. Although products here may be not the best quality items, it’s a fun place to see and shop. You can find just about anything while wandering the warren of aisles. Get an aerial view of the Bay of Banderas and PV from a parasail harness; take a ride on a banana boat along the coast or rent a jet ski to ride the waves. All can be rented from the beach or at the foot of the pier. Book your snorkeling or scuba diving excursion at the Marina or right at the pier. Chico’s Dive Shop is located in various places around town. The most popular snorkeling and scuba diving attraction nearby is Los Arcos, where colorful fish abound, but there are other beaches that offer it, too. These can be visited just for a day trip or you can stay overnight. 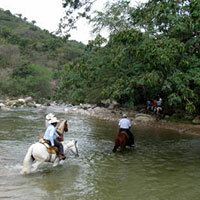 There are many places to ride horses in Puerto Vallarta, such as along the River Cuale through the jungle. Trips are available in one- to four-hour increments. You can book your horseback tour or learn more information at the booth across the street from the condo (on the southwest corner of the park). To ride horses along the beach, you’ll need to travel outside of Puerto Vallarta, since it’s not available in the town proper. This is a sunset dinner cruise where you’re entertained by mariachis and a dinner show, culminating in fireworks. You can also watch the pirate ship “sail” around the bay from the Malecón. This tour is available to purchase just about anywhere — from a tour kiosk or the pier — but you have to get to the Marina in order to take the boat (even though the boat passes right by the pier). You leave from the Marina pier in the late afternoon, cruise along the shore to Las Caletas (a beach located past Quimixto), where you enjoy a beachside buffet dinner at sunset. The show — after dinner — is similar to “Cirque du Soleil,” wherein bedecked dancers and performers entertain you in a beautiful silhouette performance. It’s a very highly rated tour and while on the spendier side (around $100.00 per person) is well worth it. There are many other things to do in Puerto Vallarta than we’ve listed here; these are just the ones that we’ve done and enjoyed.